The Guest Access feature allows you to create a separate network for your guests to access the internet only. This feature is automatically enabled by the Linksys Connect software. However, you can also configure it using the web-based setup page. 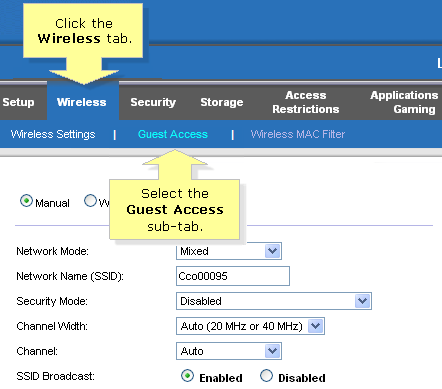 NOTE: Only some of the Linksys Wi-Fi, Smart Wi-Fi Routers, and the Linksys X-series Gateways (X1000, X2000, X3000, and X3500) have the built-in Guest Access feature on their web-based setup page. 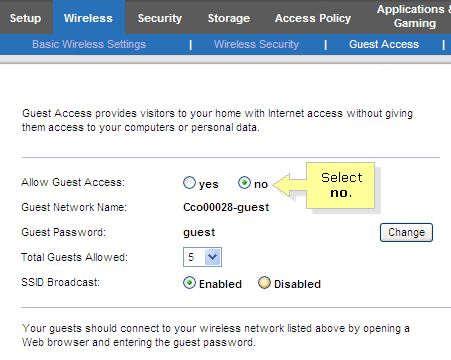 The steps below will guide you on how to disable the Guest Access feature of your Linksys router or gateway. If you want to learn how to enable Guest Access instead, click here. Launch a web browser, such as Internet Explorer® or Safari® and enter “192.168.1.1” in the address bar. NOTE: For instructions on how to access the web-based setup page through the Linksys Connect software, click here. NOTE: This tab may not be available for certain models. To learn more about the Guest Access feature of Linksys Connect, click here. In the Allow Guest Access section, select no. Your Guest network is now disabled.